The food in Turkey is delicious. There is really no other word to describe it. I have actually missed it so much that last weekend I went to the Turkish restaurant in the neighborhood, but it was only a faint comparison. 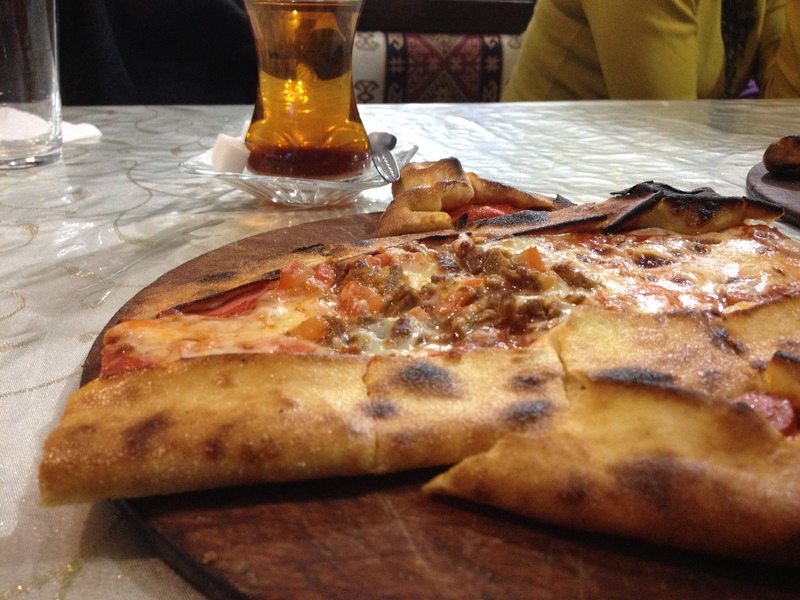 Anyways, my favorite food by far was the Turkish pizza, called Pide. 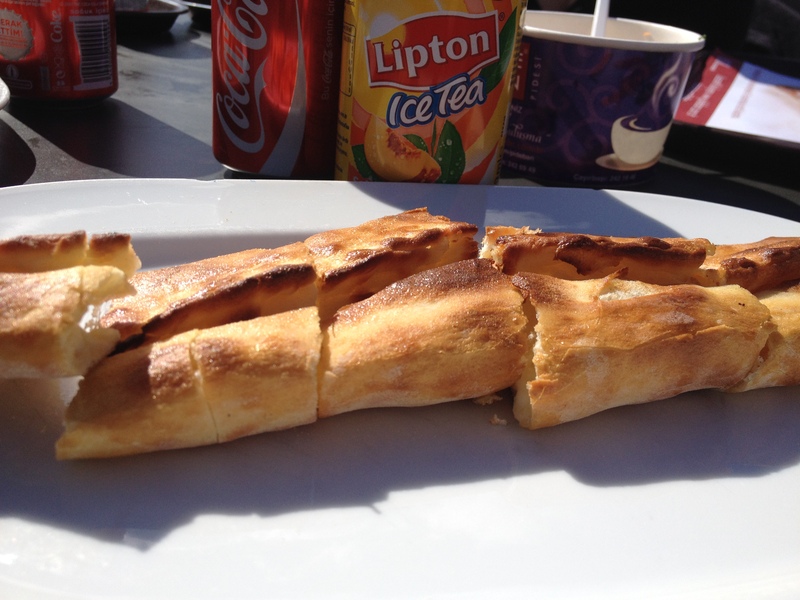 Pide Pizza and Apple tea. This pizza had some sort of minced meat and a special type of pepperoni. This one looks more like a baguette, but I promise it had lots of gooey cheese in the middle! Also, random fact, the Lipton iced tea in the states is horribly sweet, but outside of the US it always has just the right amount of sugar! Go figure. 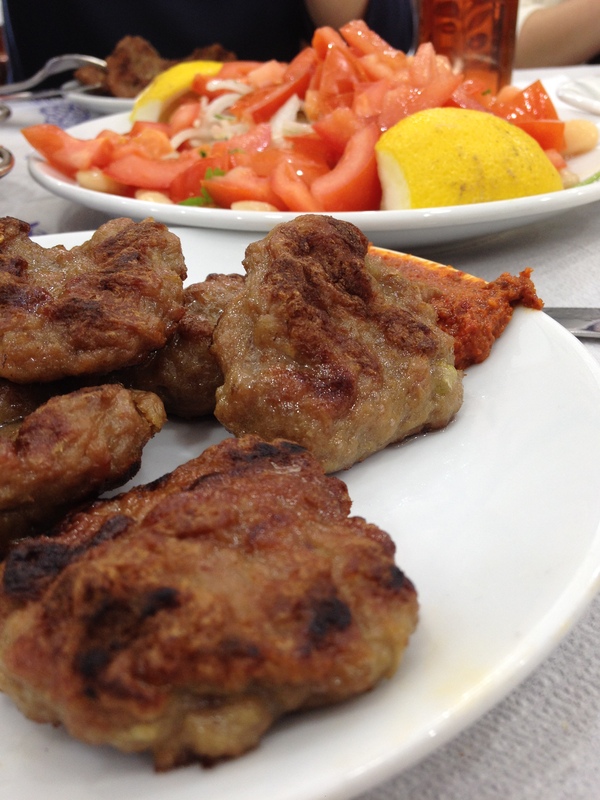 My second favorite food was Kofte, a spiced, grilled, meat-ball like food. Literally the only thing this restaurant served was Kofte and salad. We didn’t get menus when we walked in, just Kofte, Kofte, and more Kofte! Lamb Shish Kebab and Kofte. The Turkish people make rice really, really well. So well, that we would order extra sides of it! 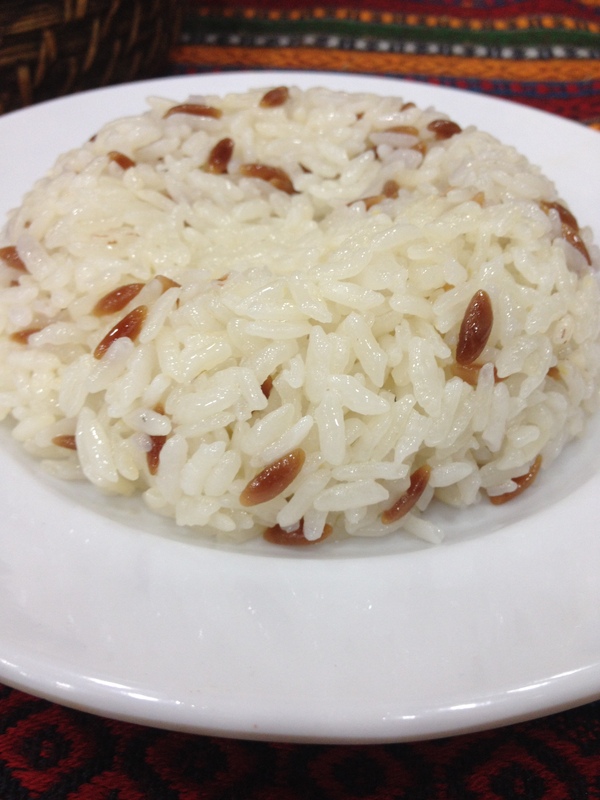 It’s called Pilav (like pilaf!) and it usually has some sort of oil that gives it such a distinctive, light, pleasant flavor. One night our group was invited to a Turkish family’s home for dinner! It was such an interesting cultural experience. They served dinner buffet-style and had many different dishes. I only took one picture, because I didn’t want to seem like a creeper, but everything was delicious! 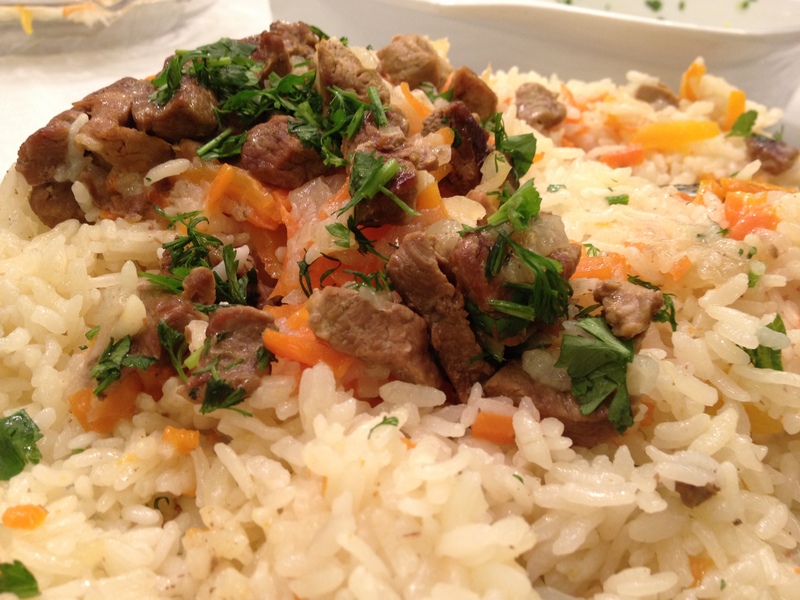 This was another Pilav (rice) dish, but with meat. The lady told us that you put the meat at the bottom, then add the rice, and then flip the entire dish over onto a plate so that it looks really pretty. It was delicious! That’s Doner. It’s like a giant slab of meat that is continually roasting. They either serve it on a bed of rice, or in a sandwich/wrap if you get it on the street! 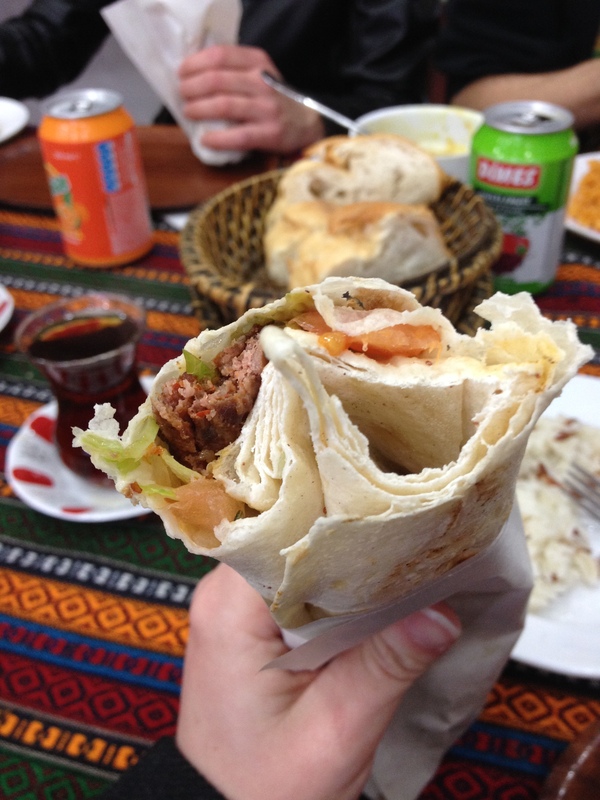 Adana meat, which is a lot spicier than normal meat, in a wrap with lettuce, tomato, cucumber, and other yummy things. 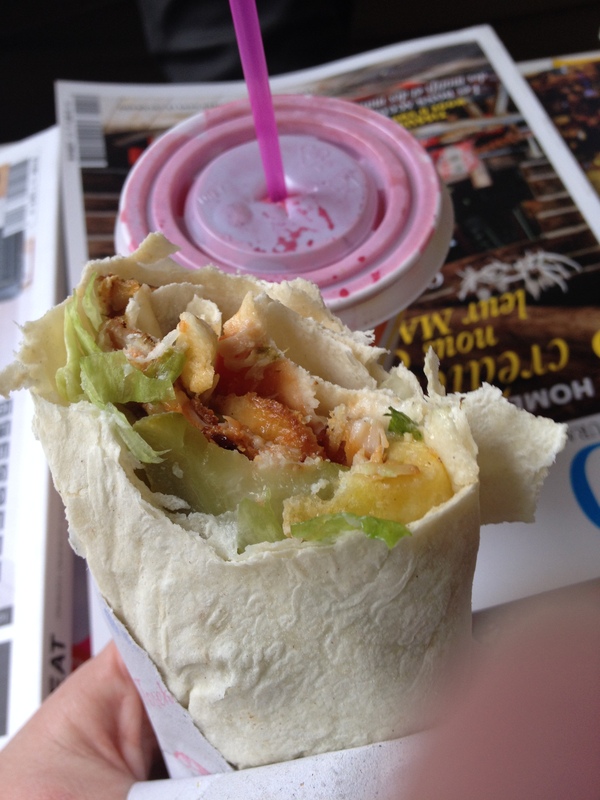 Chicken Doner and freshly squeezed pomegranate juice! It was a little too tart for me, but what was I expecting?? Chicken Shish. That yellow thing on the plate was in fact mashed potatoes! I was so surprised to find them outside of the states! Ottoman Food: One night we went to an Ottoman restaurant in the neighborhood. 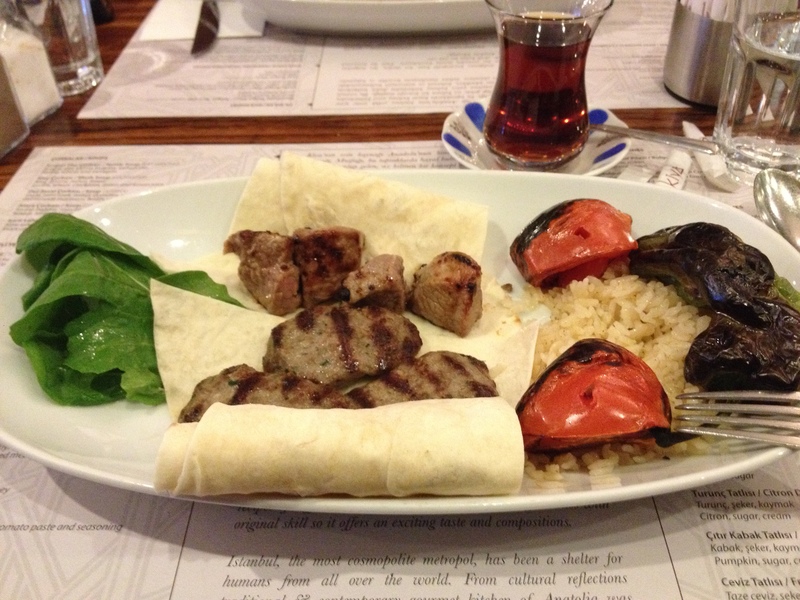 Apparently Ottoman food is different from Turkish food because they tend to serve fruit in their meat dishes! I really wish I wrote the name of the dish down. 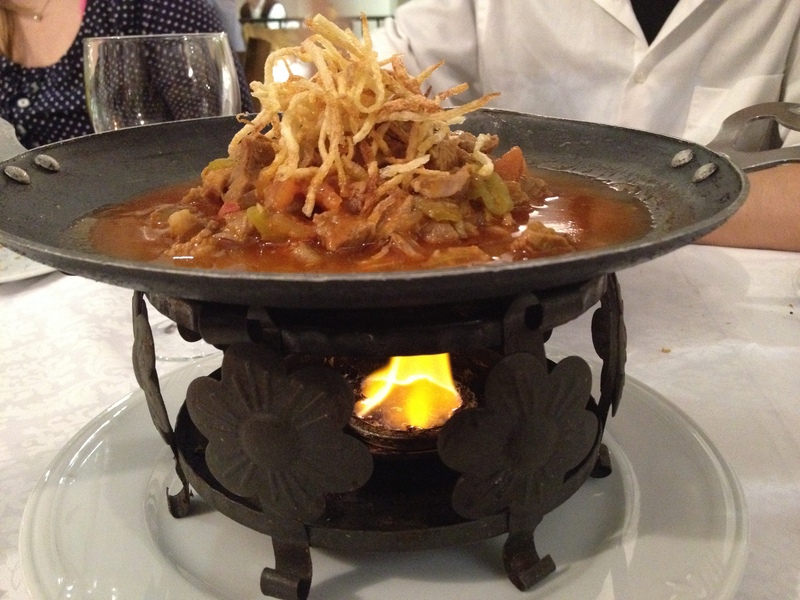 We were at an Ottoman restaurant, it was lamb and it was fantastic. They also served it with an open flame! 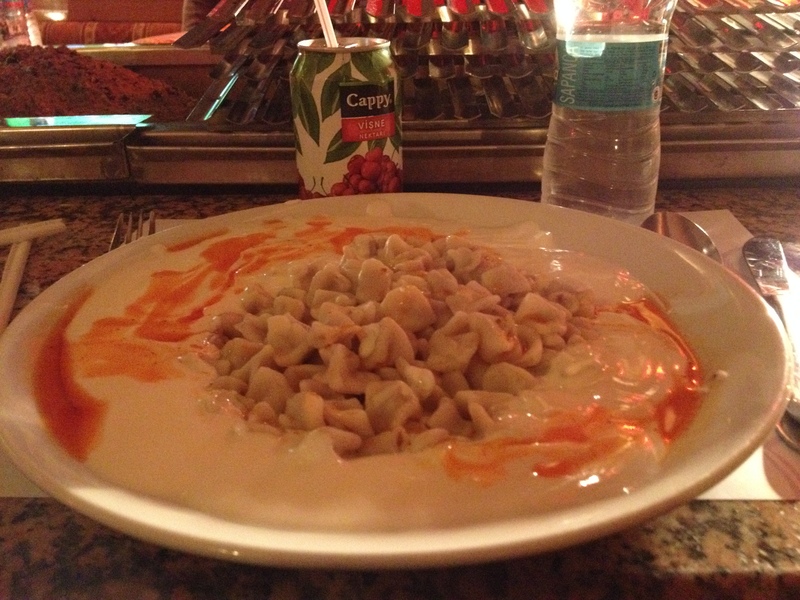 Manti, according to Wikipedia are Turkish dumplings, but I thought it was just filled pasta shells! They contained spiced meat and they were covered in some sort of yogurt sauce. One day, while we were with a CHP (political party in Turkey) candidate, we went to have lunch with the textile workers of Beyoğlu, a district in Istanbul. There were so many different groups of people from all over the world! The textile companies provide meals for their workers and give them lunch breaks, so this place was constantly full of people. They all segregated to sit with people who spoke their own language, but I met a man from Nigeria because he was the only worker there that we knew spoke English. I wish I could have found a way to discover how many different countries the workers were all from! 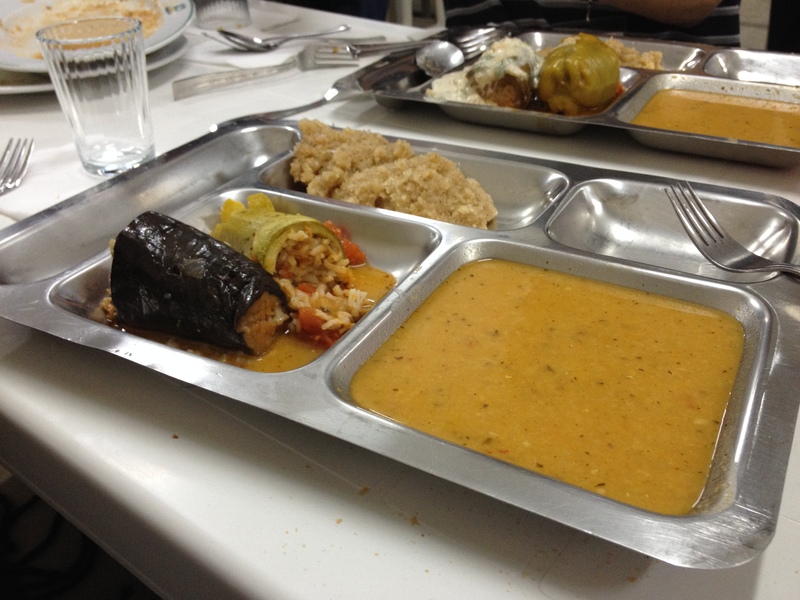 Front: Roasted squash and eggplant stuffed with rice, and some sort of soup. Back: Dessert. I have no idea what it is called (there were no signs anywhere) but it tasted like cinnamon and the texture reminded me a little bit of couscous. Good stuff. Okay, I lied earlier. 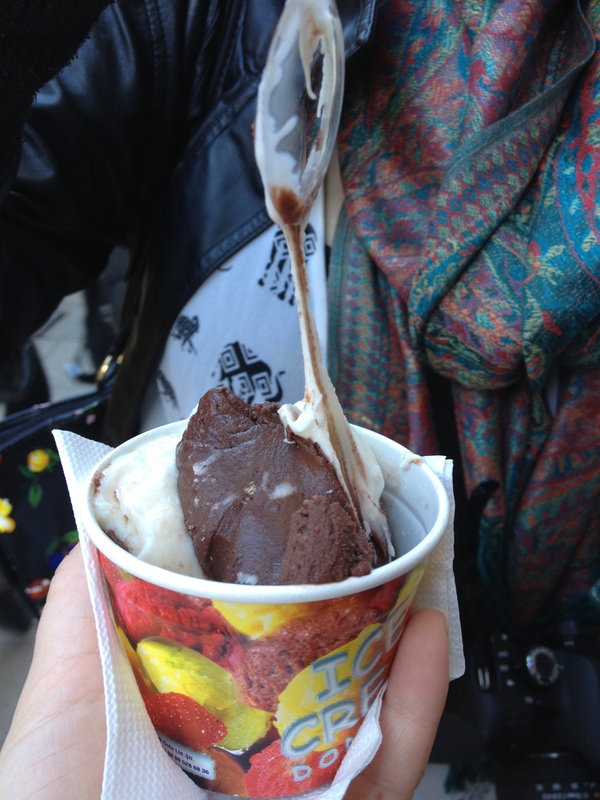 Istanbul does sell ice-cream in the winter, but you really have to search for it. Every time I saw that rare someone with ice-cream in the street, we were always rushing to our next meeting of the day! I was convinced that it was my fate to never have the pleasure of trying Turkish ice-cream, but by pure luck I found it on my last day! 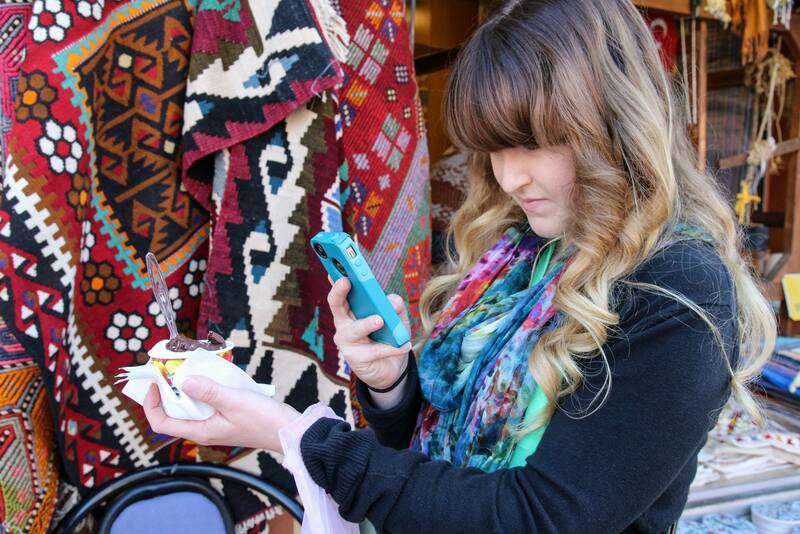 Here’s a picture of me taking a picture of the ice-cream, because I was so excited to finally find it! See how stretchy it is? The ice-cream itself was actually very good, but it was slightly chewier than most ice-cream! 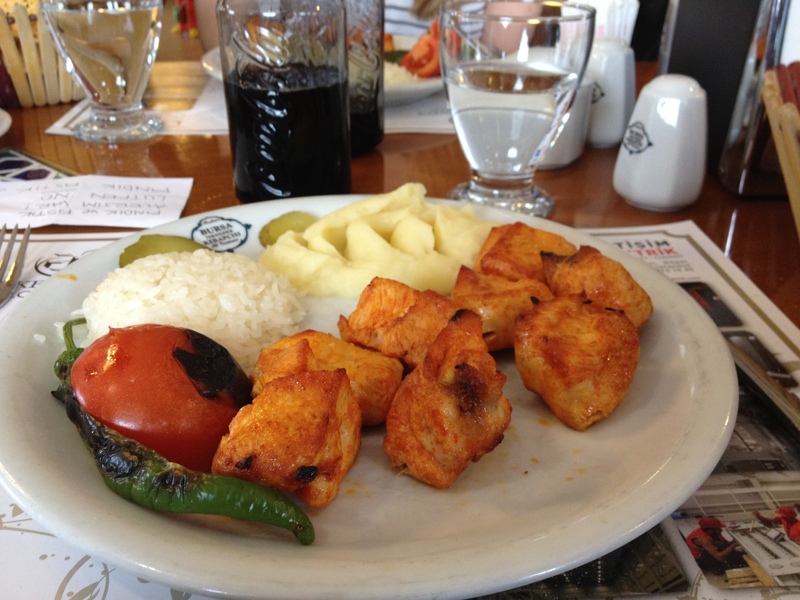 Enjoyed the all the pictures of Turkish food? Please subscribe (click Follow blog via email in the column on the right!) to receive this blog’s updates via email! Also, I love getting feedback so please comment! Previous PostResearch in Turkey: Or How No One Would Answer My QuestionNext PostHappy Turkish local election day! Good for you for having this marvelous adventure with food. I’ve heard others say they’d wait until they got back home to eat. They never knew what they had missed. It’s so good to hear from you Aunt Ethel! I’m glad you liked this post 🙂 I can’t imagine ever going to a foreign country and not trying everything I could! We are enjoying your blog, Emily. My brother and I spent a couple weeks in Turkey an eon ago and your accounts bring back lovely memories. Here – pide, and doner kebab are two things we have searched for ever since, but it’s never been as good as it was in Istanbul. Did you have our favorite breakfast (served everywhere we stayed at the time) of olives, baguettes and honey, with fresh squeezed orange juice?